Product Attributes In Magento 2 decide the way of using the attribute in the catalog its behavior and appearance on the shopping website, and in data transfer operations. The properties and labels associated with each attribute decide how it can be used, and its presence in the shopping website. Properties This section includes basic and advanced attribute properties. Labels The label identifies an attribute in the Admin and also in the storefront of each store view. If your store is the multi-lingual site, a different translated label for each language is recommended. Storefront Properties The Storefront Properties decide how an attribute can be used in your store, its appearance, and behavior. You can specify if attributes are available for search, layered navigation, product comparisons, price rules, and sorting. For text attributes, you can use the WYSIWYG editor, and decide to use or not to use HTML tags in formatting the values. To know how to use attributes while creating a product, read this article: Product Attributes In Magento 2 Catalog. Use in Search Set option to “Yes” to allow people to search the catalog based on the value of this attribute. Search Weight Set Search Weight from 1 to 10 to weight the search results. Visible in Advanced Search Allows customers to enter search criteria through a form. Comparable on Storefront Set option to “Yes” to include this attribute as a row in the Compare Products report. No The attribute will not be used as a filter in the layered navigation. Filterable (with results) Layered navigation includes only those filters for which comparable products can be found. The attribute value that already applies to all products shown in the list doesn’t display as an available filter. Attribute values with a count of no product matches will not on the available filters list. The filtered products list includes only those that match the filter. The products list is updated only if the selected filter(s) change what is shown. Filterable (no results) Layered navigation includes filters for all available attribute values and their product counts, including those without product matches. The value displays as a filter but is crossed out if the attribute value is a swatch. Position Decides the position of the attribute in layered navigation concerning other filterable attributes. 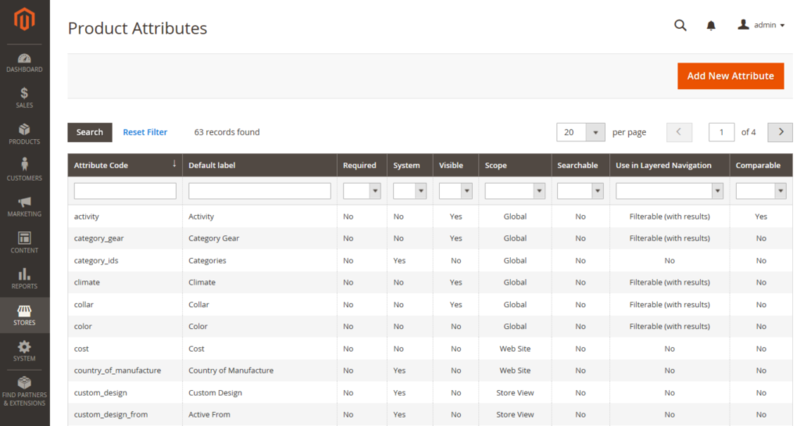 Used for Sorting in Product Listing Depending on the theme, includes the attribute as a “Sort By” option for catalog listings.